I was humbled and honored to receive the award "Best In Show" from the York Art Association. This was a painting of my granddaughter and our puppy, two things that I hold dear to my heart. I am excited to keep painting portraits of people's children and pets! Opening Reception for "Mother and Baby" Painting Exhibit is Thursday, July 13th from 5-7pm. It is located at the Marketview Arts Gallery at 37 W. Philadelphia Street, York Pa 17401. Kelly will be featuring her oil paintings of the special relatioship between mother and baby animals. Maryel Henderson will also be featuring her abstract paintings, "Through My Eyes." I will be doing a Powerpoint Presentation titled, "How to Write and Illustrate a Children's Picture Book" at Southern Elementary on Tuesday, November 15th. It will teach children how to start with writing ideas and rough sketches all the way to the published book. My friend, Maryel, and I will be having a story time and book signing at the Mason-Dixon Library on Saturday, November 12th at 11am. Hope to see some of you there! Hattie and I will be doing a book reading/signing at The Pied Piper at Cross Keys in Baltimore on Saturday, October 29th at 11am. We will have coloring activities, time with Hattie and refreshements! 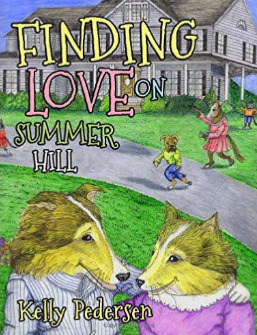 Goodreads Giveaway of "Finding Love On Summer Hill"
This giveaway has not been approved yet. Bring your children and grandchildren to BAM on Saturday, October 22nd at 10:30am. I will have coloring activities and you can meet, Hattie, dressed up as my main character! Come join me at the Book Reading and Signing at Wee Chic Boutique on Saturday, October 8th at 11am. It is at 2360 W Joppa Road, Lutherville, MD. I will be having a special guest, Hattie the Sheltie, dressed up as the main character. I will also have coloring activities of some of my illustrations. October 7th from 5-8pm. She will be offering both hardcover and softcover books to be purchased for gift giving. She will autograph and personalize them for you. She will also be offering a give-away of three of her books! You can submit your name and three winners will be announced at 8pm. If you have a passion for rescue pets and children you will love this book. Come join us for a special time of fun and refreshments!